Shred cheese by hand. Pre-shredded will not melt well. Grease an 8-inch round baking dish with tall sides or a pie pan. In a large pan over medium-high heat, cook and stir onion, garlic & peppers in hot oil for 3 minutes until softened. Add beans & salsa and cook for 2 minutes just to blend flavors. 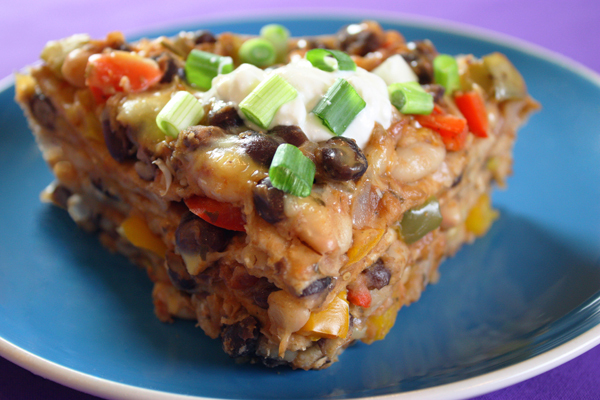 Layer in this order: 1 tortilla + 3/4 cup hot bean mixture + 1/4 cup cheese. Repeat, ending with beans & cheese. Optional: Serve with sour cream and/or garnish with green onion. 6 Comments on "Easy Tortilla Pie"
Healthy and very tasty! Thank you! Very delicious! For some reason, it tastes even better the next day! Very, very good. I made it for dinner today and everybody liked it. I made it with medium salsa. . Quick, easy, healthy and tasty. Thank you for the recipe. Hi Jenny, I think this recipe sounds so tempting I can’t wait to try it and share with my daughter who has a meatless meal one night every week. I happily share your website with all my friends. Love to watch you cook! This tortilla pie recipe sounds deliscious! Can’t wait to make it! I have all the ingredients on hand but tortillas…..need to keep some in the freezer so I will be able to make this at any time!